Chefs Collaborative is coming back to Charleston. 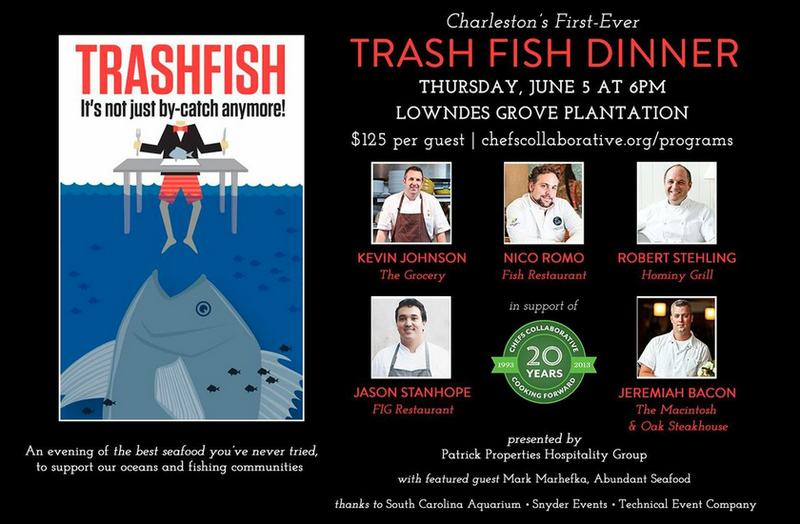 We have to be honest, we fell in love with Charleston when we were down there for our 2013 Sustainability Summit, and we’re glad to have worked with members of the community again, this time to put on a Trash Fish Dinner. Featuring a star lineup of Charleston chefs, diners tasted delicious preparations of under-appreciated fish like amberjack, white grunt, little tunny, spanish mackerel, and jolthead porgy. All enjoyed some of the best seafood never tried, all in an effort to support ocean health, fishing communities and the work of Chefs Collaborative. The Charleston Trash Fish Dinner was held on Thursday, June 5th at 6PM at the picturesque Lowndes Grove Plantation. We want to thank our generous hosts, Patrick Properties Hospitality Group, and also our featured partner Mark Marhefka of Abundant Seafood, who provided the fish for the dinner.